A trick played by every good pizza restaurant, in fact most restaurants of any kind, is to make the very difficult look very easy. 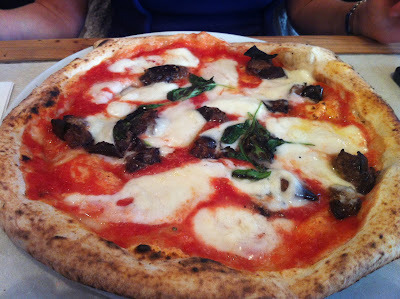 Making a good pizza is not easy, not by a long way; you have to use the correct dough made with the correct type of flour, find top-quality (e.g. San Marzano) tomato purée and proper Italian mozzarella. You need a fiercely hot pizza oven, staff who know how to use it, and management skills to ensure consistent quality. 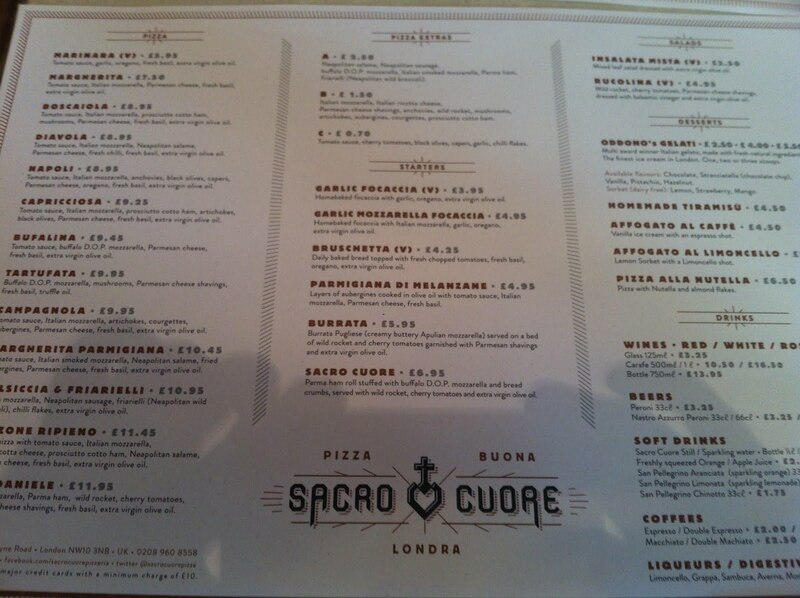 Watching the chefs at Sacro Cuore, however, you'd be forgiven for assuming that making a good pizza is no more demanding than grilling a slice of cheese on toast. Onto briefly-spun dough goes a layer of tomato sauce and a few chunks of cheese. Depending on the order, further toppings may involve some Neopolitan salami or leaves of fresh basil, before the whole thing is flung to the back of the pizza oven then ignored as long as it takes to prepare another one. 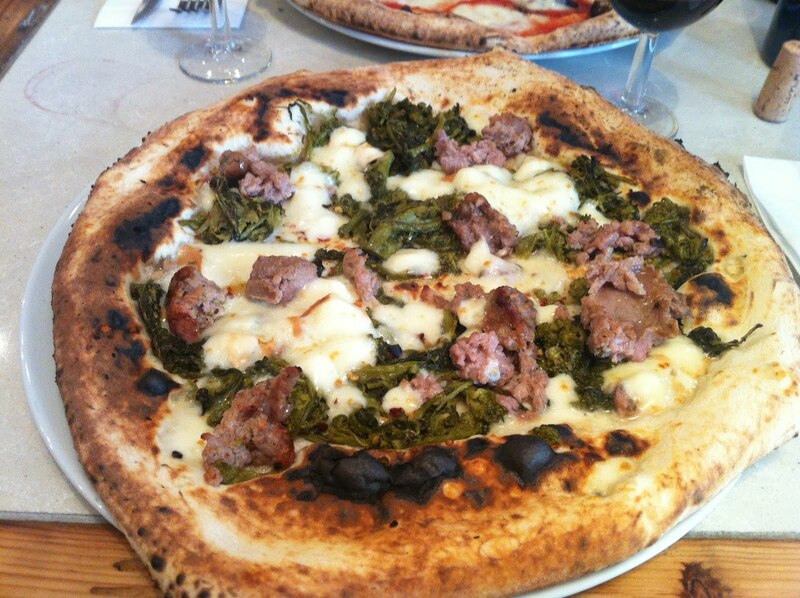 Finally, without any obvious help other than the chef's own intuition, a perfectly-timed pizza is retrieved from the oven and makes its way to the table. Whatever they're doing, it's working. A "Bufalina" (£9.45, tomato sauce, posh buffalo mozzarella and basil with an additional aubergine topping for £1.50) was a faultless demonstration of everything that's good about pizza - fantastic tomatoes and a generous amount of salty, stretchy cheese. 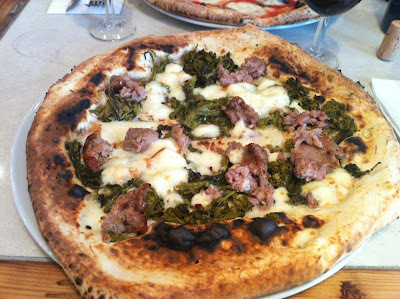 "Salsiccia & Friarielli" (£10.45) was a pizza bianca (no tomato sauce) with huge lumps of Neopolitan sausage and mounds of moist friarielli (the Neopolitan name for Rapini) nestling in mozzarella. Both were distinguished by their incredible bases, as rich and enjoyable as any flatbread you've ever had, bubbly and crisped up on top and with the kind of chewy bite that makes you want to keep eating until you can eat no more. There's a very reasonable (and very Italian) wine list, a short but tempting arrangement of starters such as bruschetta and burrata, and a couple of pleasant salads. 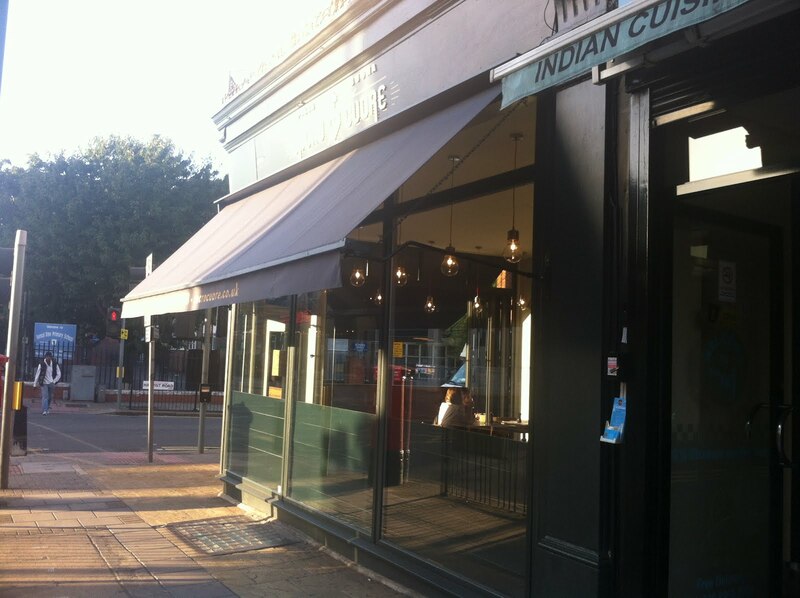 Service was a little bit wobbly but nothing that can't be excused from a venue open less than a month, and if this new location doesn't quite have the atmosphere (I'm reliably informed) of the Ealing original (this is the 2nd restaurant from the same team), it makes up for it with attractive carpentry and bright floor-to-ceiling windows. It is a very, very nice place to eat. 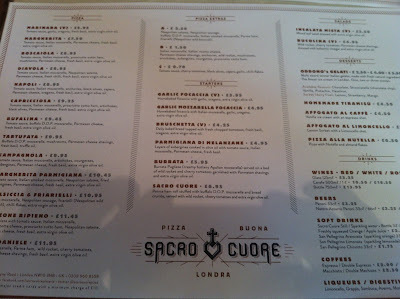 Needless to say, if it really was as easy as Sacro Cuore makes it look, our high streets would be populated not by the cream-cracker-blandness of Pizza Express or the shallow-fried nastiness of Pizza Hut but with lovely Neopolitan pizza. That they're not - yet - is of course frustrating, but their slow expansion across London alongside fellow pizza masters Franco Manca is a heart-warming sign that things are improving. And once enough people notice the difference, and proper pizza gets the attention it deserves, I'm sure there'll be no stopping them. Today Kensal Rise, tomorrow the world. You make me hungry! So jealous. Longing for a real pizza. I think you've just summed up great Italian cooking in general - it's simple stuff executed perfectly. Wow, it looks delicious. I think I prefer to order the second one. Your last paragraph had me shouting "magari!" out loud. If and when that happens, all will be right with the world.